B U B B L E G A R M: Line and Shine - Heads up! Line and Shine - Heads up! I was recently sent a few things from Eyeko including these double ended 'line and shine' fat pencils for review purposes. At first I was a bit sceptical about their quality and and pigmentation, but turns out I didn't need to be. However, I do not like them for what they are marketed for. There are 3 duo's available. 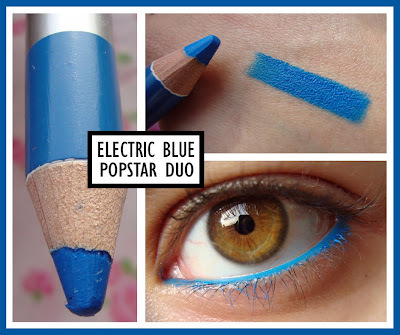 My favourite duo is the 'Popstar' duo which includes the shade 'Electric blue' perfect for a summer holiday or to add interest to any look. I was sent 2 of the duo's, Here is a closeup. Swatches - You can see the pigmentation for yourself. How to use? They are actually marketed as eyeshadows, However they are terrible for that purpose as they crease like crazy. I tried these as a liner for my upper lash line and as a base but it still transfers and creases. I found that these are perfect for the waterline and to smudge underneath, I wore mine all night and it had amazing staying power. Would I recommend them? Yes, but only if you are looking to experiment with colour on your waterline without breaking the bank. However, the black glitter one doesn't last as long as the others, which was very dissapointing. What do I think of Eyeko? Mixed views; I don't really like their packaging but I like their affordable prices. I hate their nail polishes, I think their bronzing cream is 'OK'. I was also sent a felt tip graffiti liner which is actually REALLY nice. EXTRA NOTE: I understand that reviews of products from PR companies can become VERY boring, but I think it's important to get some swatches and opinions posted. I was not paid for this post. thanks hun, I think electric blue will be perfect for the summer! @beautyandtheblog not sure what you mean by that :) ? I always envy the quality of your photos, the swatches are perfectly clear! 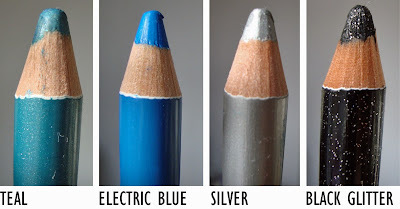 Mmm do you think the electric blue would make a good base, I've been looking for an electric blue and have been umming and ahhing over this one and the barry m matt blue. Wow that's beautiful I love what you did with the blue one ! @Pinkalishy No, it creases like crazy! @hollywood & @cocobella thanks girls! That blue is amazing! So bright and pretty! I ordered these and some other bits a couple of weeks ago and my parcel still hasn't shown up :( so far the company hasn't been very helpful either. 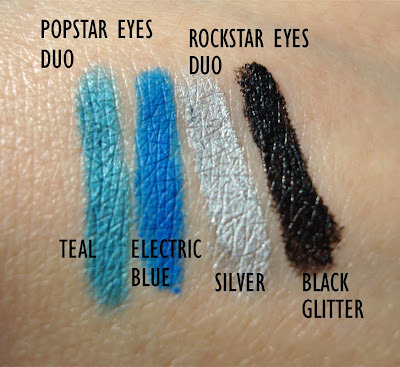 The blue looks gorgeous on your waterline! Thanks so much for the tips! They really are helpful and I appreciate your honesty! @vadilucia I would say that those rules are true to a certain extent, it depends on the face shape, features and complextion.